Recycled lead is a valuable commodity and for many people in the developing world the recovery of car and similar batteries (ULABs) can be a viable and profitable business. Therefore, the market for reclaiming secondary lead has been growing, especially in developing countries. Many developing countries have entered the business of buying ULABs in bulk in order to recycle them for lead recovery. These ULABs are often shipped over long distances for recycling, typically from the industrialized countries that produce, use, and then collect the spent batteries for reprocessing.3 Currently ULAB recycling occurs in almost every city in the developing world, and even in some countries in rapid transition. ULAB recycling and smelting operations are often located in densely populated urban areas with few (if any) pollution controls. In many cases the local recycling operations are not managed in an environmentally sound manner and release lead contaminated waste into the local environment and eco systems in critical quantities. 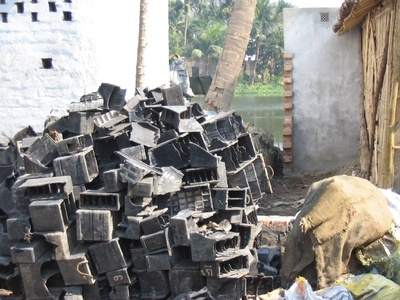 Blacksmith Institute estimates that over 12 million people are affected by lead contamination from processing of Used Lead Acid Batteries throughout the developing world. As urban centers in the Global South become more populated the confluence of high unemployment rates, with increased car ownership, have led to a proliferation of informal ULAB reconditioning and recovery activities. These are often conducted by economically marginalized members of society, needing an additional source of income, but without any understanding of the risks involved. The informal process of recovering secondary lead from the ULABs includes breaking the batteries manually with an axe. In many cases, informal battery melting is a subsistence activity, and undertaken in homes (even in the kitchen), using archaic melting operations to recover and sell the secondary lead to the larger processers. Despite efforts by government agencies and the industry to bring safer and more efficient practices into this stage of the recycling process, ignorance of the risks of lead contamination combined with a lack of viable economic alternatives has led to the systemic poisoning of many poor populations throughout the developing world. About 6 million tons of lead is used annually, on a worldwide basis, of which roughly three-quarters goes into the production of lead-acid batteries, which are used in automobiles, industry and a wide range of other applications. Much of this existing demand for lead is met through the recycling of secondary material and in particular from lead recovered from Used Lead-Acid Batteries (ULAB). This high level of recycling is very effective in reducing the volumes of lead dumped in the environment and in minimizing the need for mining more ores. However, in many places, much of the recycling is done on an informal basis, in unhygienic and dangerous conditions and resulting in serious lead poisoning of the recyclers themselves and the neighboring communities. Throughout the informal recycling process, there are opportunities for exposure. Most often the battery acid, which contains lead particulates, is haphazardly dumped on the ground, waste pile or into the nearest water body. As the lead plates are melted, lead ash falls into the surrounding environment, collects on clothing, or is directly inhaled by people in close proximity. Soil containing lead compounds can turn to dust and become airborne, enabling the lead compounds to be easily inhaled or ingested in a variety of ways. Lead can also leach into water supplies. Children, in particular are often exposed to lead when playing on the waste furnace slag and handling rocks or dirt containing lead, while engaging in typical hand-to-mouth activity, as well as by bringing objects covered with lead dust back into the home. The most common route of exposure for children is ingestion, as lead dust often covers clothing, food, soil and toys. Acute lead poisoning can occur when people are directly exposed to large amounts of lead through inhaling dust, fumes or vapors dispersed in the air. However, chronic poisoning from absorbing low amounts of lead over long periods of time is a much more common and pervasive problem. Lead can enter the body through the lungs or the mouth, and over long periods can accumulate in the bones. Health risks include impaired physical growth, kidney damage, retardation, and in extreme cases even death. Lead poisoning can lead to tiredness, headache, aching bones and muscles, forgetfulness, loss of appetite and sleep disturbance. This is often followed by constipation and attacks of intense pain in the abdomen, called lead colic.5 Extreme cases of lead poisoning, can cause convulsions, coma, delirium and possibly death. Children are more susceptible to lead poisoning than adults and may suffer permanent neurological damage. Women that are pregnant and become exposed to lead can result in damage to the fetus and birth defects. The challenges of ULABs are recognized by the industry and by the Basel Secretariat, who administers the relevant Convention. In some countries, the recycling systems have become formalized and are more or less well regulated. However, in many poorer countries, there is a large informal component alongside the established, larger recyclers. The Blacksmith Institute is currently trying to mitigate lead pollution from ULABs in seven countries around the world with a project entitled, “The Initiative for Responsible Battery Recycling”. The project focuses on ending endemic exposure to lead from improper ULAB recycling through education, remediation of legacy contaminated soils, developing new responsible policies on appropriate management of ULAB, and either formalizing the ULAB collection or providing other sources of income for the informal sector operators. 4 Cahners Business Information 2001. Lead: Market Prices Won’t Ignite. Purchasing 130:3, Reed Elsevier, Inc., Feb 8, 42-43. Empty car battery casings. India. Photo by Blacksmith Institute. These children are developmentally impaired as a result of lead poisoning. Haina, Dominican Republic. Photo by Blacksmith Institute. 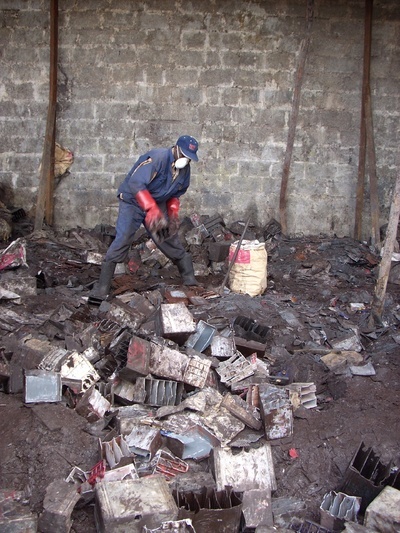 A worker sorts through used lead acid batteries. Kenya. Photo by Blacksmith Institute.